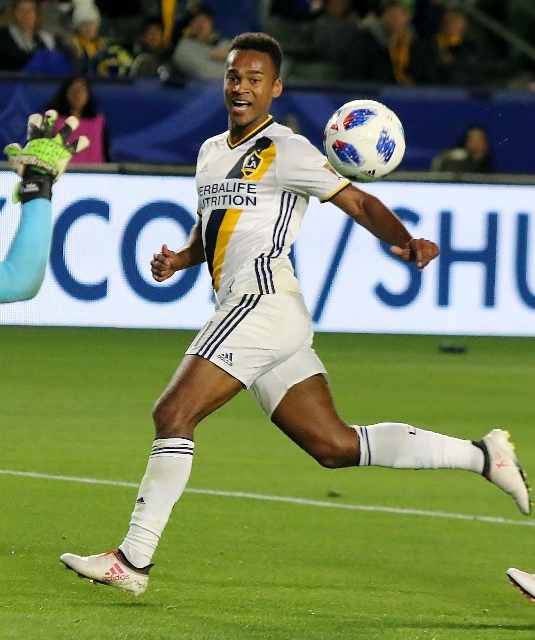 (Carson) – The Galaxy scored three times in the second half and rolled to a 3-0 win over Real Salt Lake Saturday night before 25, 462 at StubHub Center. After a scoreless first half, Zlatan Ibrahimovic scored twice in a six minute span to open it up a and Ola Kamara sealed it with a goal ten minutes later. In the 61st minute Ibrahimovic took advantage of a nice cross and headed one in past Real Salt Lake goalkeeper Nick Rimando for a 1-0 lead. Six minutes later Ibrahimovic made it 2-0 off another cross pass from Servando Carrasco. Kamara put it on ice in the 77th minute when he got loose and beat Rimando again for the three goal lead. Both teams had opportunities in the first half but weren’t able to push anything across. Real Salt Lake had a free kick early but was unable to convert. Perry Kitchen had a run at the goal in the 42nd minute but Rimando made the save. It appeared the game was headed toward a scoreless tie until the Galaxy exploded mid way through the second half. The Galaxy, coming off a 1-1 tie with Portland last week, improved to 6-7-2 on the year, while Real Salt Lake dropped to 7-7-1. The Galaxy is currently eighth in the Western Conference.